Factory AC15C1 Grill Assembly - Less Vox Logo - These are complete, factory original front panel assemblies that were removed from new Vox AC15C1 amps that received the North Coast Music exclusive baltic birch baffle upgrade. 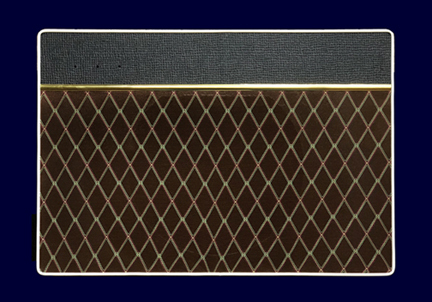 The baffle panel is made from MDF (medium density fiber board). It is covered with brown Vox grill, black basket weave vinyl and trimmed with gold fascia strip and white piping. Includes speaker mounting tee nuts and speaker mounting screws. Less logo (use our NCM-025 logo) but predrilled for easy logo installation. Actual panel size, less grill, vinyl and piping: ~21 13/16" x ~15" x 3/4". Sales final, no returns. Factory AC15CH Head Grill Assembly - Less Vox Logo - Factory MDF original front panel assemblies removed from new Vox AC15CH amp heads that received the North Coast Music exclusive baltic birch baffle upgrade. Actual panel size, less grill, vinyl and piping: ~21 7/8" x ~7.625" x .75". Sales final, no returns. Factory AC30CH Head Grill Assembly - Less Vox Logo - Factory MDF original front panel assemblies removed from new Vox AC30CH amp heads that received the North Coast Music exclusive baltic birch baffle upgrade. Actual panel size, less grill, vinyl and piping: ~25.625" x ~7.625"' x .75". Sales final, no returns.